In the presence of Andhra Pradesh Cheif Minister, Sri. 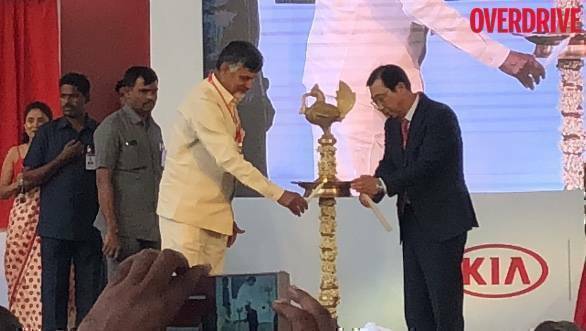 N. Chandrababu Naidu, and Mr. Han-Woo Park, President and CEO of Kia Motors Corporation, Kia India celebrated the installation its factory framework at its upcoming plant site in Anatapur, AP. Spanning across 536 acres, Kia's upcoming manufacturing plant has attracted an investment of over $1.1 billion. Kia says that this is their 15th plant worldwide and that it will provide up to 3,000 direct job opportunities. AP CM, Mr. Naidu confidently expressed that his state will provide plenty of talented human resource to make the most of these opportunities. To that effect, Kia Motors India and the Government of Andhra Pradesh are planning to design training programs to hone skills of the local residents. The confident CM added that his government wants to make Andhra Pradesh an automotive manufacturing hub and that the state will do the needful and provide the resources to create a healthy ecosystem for automotive brands and OEMs. Kia proudly announced that construction work at the plant site is running ahead of schedule and that the plant should be functional by the first quarter of 2019 and production of the vehicles will begin soon after. As we revealed earlier, the production version of the Kia SP Concept shown at the 2018 Auto Expo will be the carmaker's first product for the Indian market and will be produced locally at the upcoming plant. The plant has a planned production capacity of 3,00,000 units per annum and the plant site has additional space to ramp up production by another 1,00,000 units if there is higher demand for Kia vehicles. 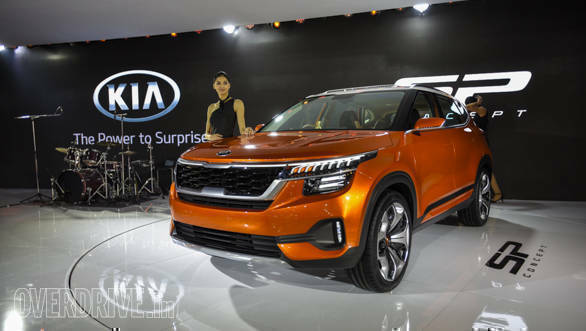 Kia hints that 90 percent of the production capacity will be utilised for supply to the domestic market, while the remaining capacity will be used for exports. "I believe Kia will bring amazing change and hope to both of the State of Andhra Pradesh and the entire India. We are here to build more than just great cars. We aim to set a new standard of automotive lifestyle experience by providing Indian consumers with world-class products and service, but also deeply engaging with the Indian people and giving back to the community whenever possible," said Mr. Han-Woo Park, during the ceremony.